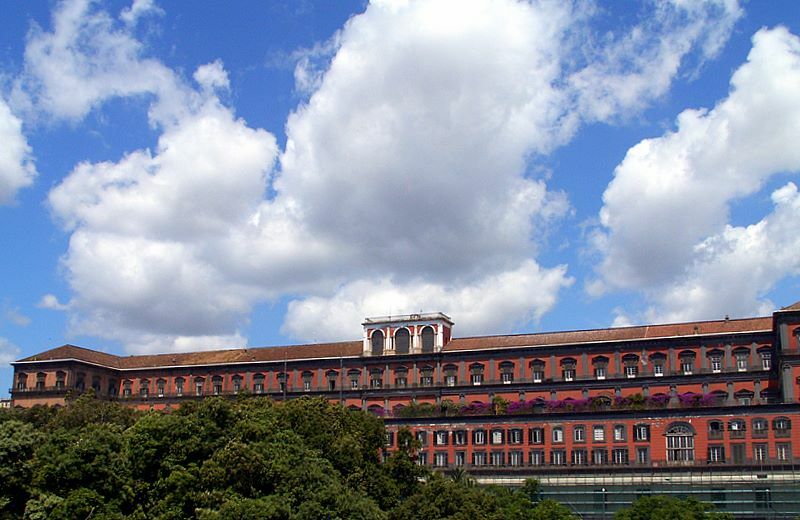 (Aug 18) - Photo of the Day 73 Overlooking the Bay of Naples is the long red southern facade of the Royal Palace. The building was conceived by Ferdinando Ruiz de Castro, Spanish viceroy in Naples between 1599 and 1603, to be a fitting residence for King Phillip III of Spain, who was planning a visit to the city. From the original version of 1600, the palace has undergone numerous architectural additions and changes. Today the palace and adjacent grounds house the San Carlo Theater, a museum and the National Library of Naples. An irony connected with the Royal Palace is that Phillip III never got around to visiting the city and staying in the house built just for him. This image is from album 4 at this link. Link here to a larger image and the general entry on the history of the Royal Palace. (Aug 19) - I know, we have our own sunken ruins all over the coasts of southern Italy, so this is far afield, but not that far if you consider that these submerged cities off the Egyptian coast once traded with the cities of the southern Italian mainland that were part of Magna Grecia. With that, the good news is that the British museum is presenting through November an exhibit entitled Sunken Cities: Egypt's Lost Worlds, dealing primarily with Thonis-Heracleion and Canopus, now submerged off the northern Egyptian coast between the Nile and Alexandria. 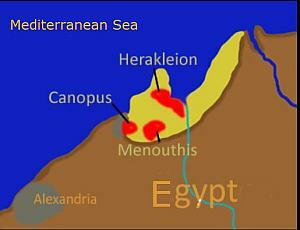 (Heracleion is not to be confused with Heracleion, one spelling of Crete's largest city and capital.) The cities have legendary beginnings as far back as the 12th century B.C. and were important Egyptian centers for trade and for the worship of Egyptian gods. The recent discovery and subsequent excavations “have transformed our understanding of the deep connections between the ancient civilizations of Egypt and Greece. The British museum exhibit displays 293 stunning objects ranging from colossal statues to intricate golden jewelry” (from the British Museum description). Heracleion was originally built on islands in the Nile Delta and flourished from the 6th to the 4th century BC. It had a number of harbors and anchorages but sank in the 3rd or 2nd century AD after earth tremors caused the liquefaction of the silt on which it was built. The city was then superseded by Alexandria. The submerged ruins were located by the French underwater archaeologist Franck Goddio in 2000. Archaeological research has been going on ever since. Any British Museum Sunken Cities internet search should take you to the exhibition site. Good news is that since I was completely ignorant of these sunken ruins, I am grateful for whatever I can get, but the less than good news is that the exhibit website (at least the one I found) seems more like a pitch to sell tickets and a no doubt informative book, but there is not much of the exhibit, itself. The exhibit has come in for such comments as, “This frustrating show about the ‘lost worlds’ of the Nile Delta has too much Indiana Jones nonsense – and not enough genuine wonders.” That is from A review in The Guardian. 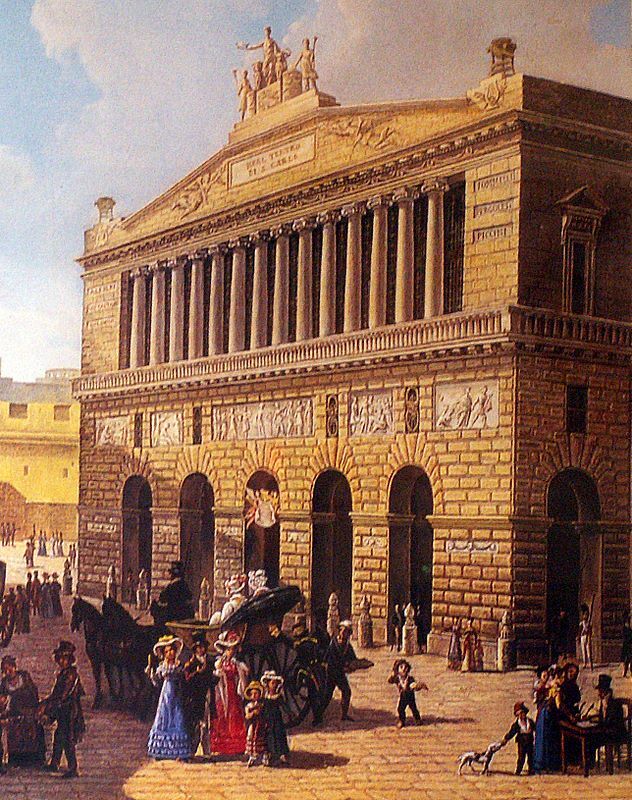 (Aug 20) Photo of the Day 74) - This is an old print of the San Carlo Theater in Naples. It's hard to date precisely, but considering the bit of background visible and the dress, it is probably before the year 1800. The facade has remained (been restored, really) the same. Even the large statue of Parthenope on top was recently restored. This image is from album 4 at this link. Link here to a larger image and the general entry on the history of the San Carlo theater. (Aug 23) Photo of the Day 76 - This is the Mercadante Theater, one block from the port of Naples and viewed from the roof of the Angevin fortress across the street (the extension of Piazza Municipio). 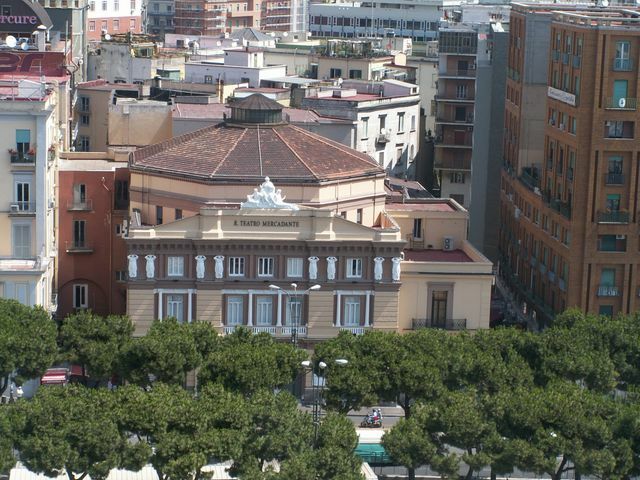 Opened in 1779 as the Teatro Fondo, it was a venue for lighter musical theater such as the Comic Opera and thus not in direct competition with nearby San Carlo. It was, however, underwritten by state funds (thus the name) and was, like San Carlo, a "royal theater" and was prestigious. The name was then changed to the Mercadante Theater in 1870 to honor Saverio Mercadante, a Neapolitan composer who had just passed away. In the latter part of the 1800s, the theater gradually left music to San Carlo and concentrated on plays and, later, vaudeville. The theater was damaged in WW2. Now, after decades of difficult false starts, the Mercadante again hosts significant contributions to the cultural life of the city. The façade is the redone version from 1893. This image is from album 5 at this link. Link here to a larger image and the general entry on the theater as well as on the composer, Saverio Mercadante. (Aug 24) Photo of the Day 77 - Sirens are one thing but this is an example of a "splay-tailed siren" (or mermaid) There are a few of them in Naples (this one is at the base of the large column at Piazza San Domenico Maggiore. It is displayed innocently enough, yet has to do with such things as the Baubo siren, apotropaic magic (the power to ward off bad luck) and anasyrma (the power of the mere "flashing" of the female genitalia to wield such power). 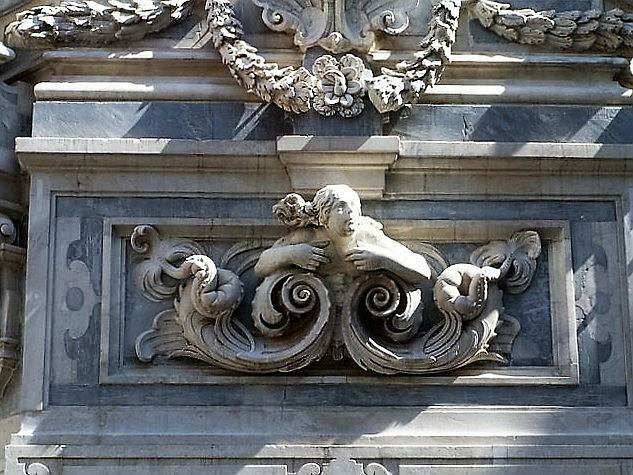 The column was finished in 1737, and the heraldic emblems, cherubs and religious figures are joined by what is obviously this splay-tailed mermaid. This image is from album 5 at this link. Link here to a larger image and entries to everything you ever wanted about those big words, good luck, bad luck and ritual obscenity in Naples. Ciro De Lellis died a few years ago but was well liked and is remembered in Avellino. I just banged out the old memory and left out the terribly slow rescue response and the shameful looting and thievery that was happening...in one pile of rubble there was a photo of just a woman's arm from a little below the wrist protruding from the rubble...and then a second photo someone grabbed of a man pulling off her ring and then dashing away. "I think we can fit one more in!" (Sep 8 -) End of summer? Cooler weather, grey skies, a bit of rain —it seems that way. Sigh. So I was surprised to hear friend and sailor, Francesco, say that he still has "more than a month of season left." He runs a charter catamaran service for tourists, but he does it in Greece not in Naples. The season is longer, everything is cheaper and, best of all, "You can sail into small ports in the Aegean and never see a motor boat. Most people have sail boats." He loves to sail. This summer he and a friend sailed across the Atlantic Ocean. Just like Columbus they landed on an exotic island in the Caribbean and were thronged by native nubile maidens on the beach. (Well, ok, but it was still spectacular. They sailed across the ocean!) Francesco is Neapolitan to the core, but sadly says, "Sail a boat here and you take your life in your hands... ...Nothing but motor boats and motor yachts owned by super-rich and super-fat Sunday sailors with no idea of seamanship, right-of-way or speed limits...they drive motor boats the way they drive cars." Notoriously, car traffic in Naples follows one principle: "Hey, what are you bastards doing on my road?!" Do that at sea and it's a disaster. 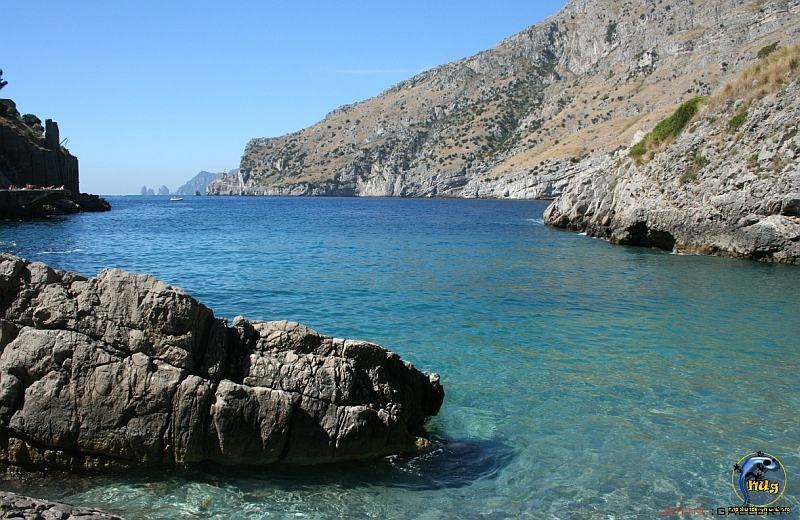 Indeed, from where I can see Mergellina harbor (image) on a late weekend afternoon, the sea is crisscrossed by wakes of motor boats speeding to get back in from up the coast or the islands. The white wakes look like the paths of subatomic particles in a bubble or cloud chamber. Once in a while, your patience pays off and there is a collision. (Sep 9 -) Waterscooters in the sewers of Naples. It sounds inviting, I know; after all, our sewers are almost as romantic as those in Paris. Actually, these scooters and the unit of SCUBA divers who drive them are part of a special police unit. There are 16 members in Naples and they did some double duty in August. The Italian STOVL (short take-off vertical landing) aircraft carrier, Garibaldi was in the main port, hosting various heads of state; this image shows two units entering one of the effluents of the watery underworld just west of the Mergellina harbor. Their job on this mission was to check for explosive ordnance planted by terrorists interested in making some kind of a statement. Nothing was found. Actually, this unit does an inspection on a weekly basis in the sewers to look for an unknown number of nefarious scofflaws (affectionately termed "the usual suspects" or the "Hole in the Wall Gang" who like to cruise in and then up into someone's place of business, preferably one with a safe with large amounts of money. If it's your business or your money, maybe it's not so romantic, but still...it's kind of Les Misérablesque. Victor Hugo, eat your heart out. (Sep 11 -) Much ado about...maybe not much. In January Apple announced it was opening a Developer Academy in Naples (the first in Europe!). Six-hundred applicants would be selected from what was expected to be a thundering herd of 4,000 young Information Technology nerds scrambling over one another for a plumb (HAR!) slot as a would-be iOS (the Apple operating system) geek. It was to be at once a shot in the arm to the local economy and prestige. From the early exams last week, as Mark Twain once said about his mistaken obituary, “Reports of my death have been greatly exaggerated.” There were 250 students who reserved places for exams. 100 showed up. About 70 were from Campania; the rest were from elsewhere in Italy and a few from abroad. Two were selected and they were students of members of the exam commission! (I know, I know—it sounds...well, they are no doubt good students.) At this point, no one seems to know what's going to happen. There were complaints that the exam was too hard and was not only all in English but English Geekese (What can I say? You should have come to my classes.) Two, there was some confusion about the number 600. Is that a slot in the Academy so I can learn to program for iOS? Or is it a guarantee of a job once I finish. Unclear. More the former than the latter, apparently. That's a problem. The iPhone and iPad sell well, true, but so do Microsoft products (you've heard of them?) and many open-source freeware systems. So this thing is still up in the air. SORRY FOR THE LONG DELAY. SOFTWARE PROBLEMS. (Nov 14 -) O Little Town of Trumplehem! Preparations for the Christmas season take longer than you might expect. Many families spend weeks preparing their manger scenes for display in their homes. Such a display is known as a presepe (see that link). Churches, of course, have their own displays, as do most shops and businesses. It saves time to use bits and pieces from the previous year, but sometimes the preparations require special attention because many popular versions of the presepe on public display in the downtown area include figurines of popular celebrities and political figures. That happened in 2008 when Barack Obama wound up in the manger. It has now happened again. A local merchant already has his Donald Trump (pictured) ready to insert somewhere in Bethlehem in as yet unspecified proximity to the Baby Jesus. I know, I know, the Bethlehemites don't understand it, either. (Nov 15 -) The Apple Academy. In spite of the cynicism expressed some weeks ago (item for Sept. 11, above) by local sources, Apple has opened its first European iOS Developer Academy. The campus is in the town of San Giovanni a Teduccio on the eastern outskirts of the city. 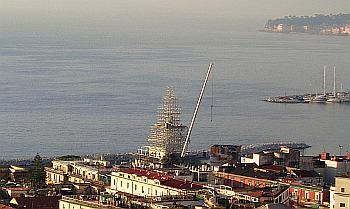 "Campus" is appropriate since the program is being developed in partnership with the Federico II University of Naples. A first group of 100 students began the nine-month course in early October. They were selected from 4,000 applicants. Not only is the course free, but they each got a new iMac, iPad and iPhone. Sign me up. No word yet on available iJobs. Mozart Vandalizes Roman Ruins--boo! hiss! (Nov 20-) Mozart Wuz Here. The other day we went back to the Piscina Mirabilis, and we noticed something peculiar. We know that in 1770 composer and musician Leopold Mozart accompanied his son Wolfgang Amadeus on a visit to Italy. 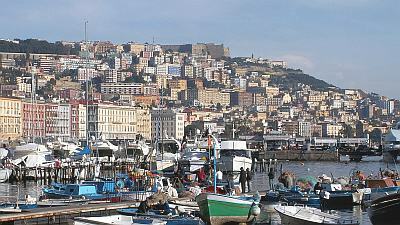 On June 16 Leopold sent a letter from Naples back home to his wife to tell her about all the sights they were seeing. It seems that a few days earlier, on the 13th of that same month, they visited the Flegrean Fields, including the ancient Roman cistern, the Piscina Mirabilis. Many illustrious visitors on the Grand Tour felt moved to mark their presence at such sites, and you can still see where they engraved their names into various walls and columns. 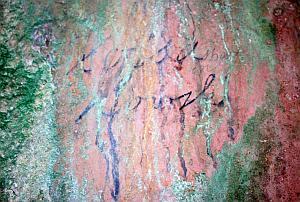 You find these markings at the Dragonara, at Virgil's Tomb, and at the Piscina Mirabilis. If you keep a keen eye out, they are all over the columns of the Mirabilis. One in particular stands out. What do you think? p.s. That's right, Leopold, you bumpkin. Teach your son to deface precious historical monuments. He'll never amount to anything, anyway. And you know that ugly scratch on the kid's favorite piano in the Mozarthaus Museum? Heh-heh! p.p.s. Così fan tutte stinks! (Nov 21)- I'm guess I'm so used to light pollution near a big city that I find this hard to believe. The photographer's name is Michelangelo Ambrosini. He was over on the island of Ischia some weeks ago doing some photojournalism and took a night-time stroll along a deserted beach at Pelara bay near the town of Forio d'Ischia. 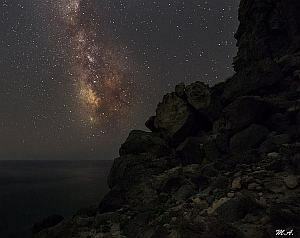 He cut through a stand of oak and into a luxuriant field of ferns, stood behind a rise and looked out over the sea and saw this view of the Milky Way (image). I wouldn't have thought this possible at sea-level in the bay of Naples. It's nice to be wrong sometimes. (Nov 22)- Europeana Regia is a project to make digitized versions of 1000 rare and precious manuscripts from the European Middle Ages and Renaissance available on-line to scholars and the general public. The focus was on three sets of manuscripts physically dispersed among different libraries and other facilities in Europe: (1) Carolingian manuscripts, (2) the manuscripts of the Louvre library relating to the time of Charles V and Charles VI, and (3) the library of the Aragonese Kings of Naples (from the 15th an 16th centuries). The Library of the Aragonese Kings of Naples is a collection of 282 manuscripts, a “unique concentration of masterworks of French, Venetian, Neapolitan, Lombard and Spanish illumination...[and]...the symbol, beyond political borders, of the cultural unity of Europe” (from the self-description of Europeana Regia). The period in question was before the formation of the modern nation state of Spain and includes material on the little-known Crown of Aragon, a vast sea-faring confederation. Details of the entire Europeana Regia project are available here. (Nov 25)- Street art, yes, because I found it painted on a wall flanking a long, long flight of steps named via Pedamentina San Martino. The steps lead from the east-west street of Corso Vittorio Emanuele that runs along the southern slope of the Vomero hill up to the area just below the San Martino museum and the gigantic Sant'Elmo castle. It is obviously a kind of graffitti street art, but other than that, I have no idea. If you know what this is, please tell me. I tried to find it on a search-by-image program. Their best guess is that it is a Haitian Voudou (also spelled voodoo) image, but I looked at hundreds of them and I don't see it. The work is signed at lower left (image left) with what appears to be the letters C (? )-Y-O-P K-A-F. Hey, wait! Belay my last. I just found it! I did your work for you. Too bad, you should have seen the prizes! CYOP & KAF are two street artists whose works are all over Naples and elsewhere in Europe, especially in the seedier areas. They have a website in approximately correct English that starts: "Lonely but straight, these two wanted artists ...follow their mission to spread abnormal, irritating, even scary signs in a desperate attempt to awaken the overdosed mind of the Italian people...". I don't know their real identities. Maybe I don't want to know. They might start sticking pins in that thing. That reminds me that I still don't know what it is, what it "means." Maybe that's a tv screen with the eyes of the OD'd masses staring mindlessly at TV. Or maybe not. I'm open to suggestions. Another wonderful wall work. 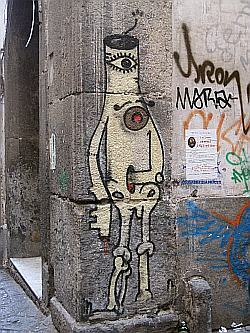 I've collected Naples graffitti on every visit. Much of it strikes me as first rate work, stylistically and technically. 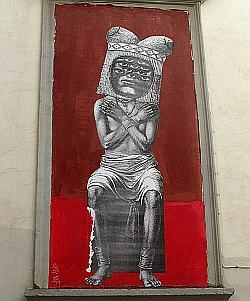 Naples graffitti artists loot the images of art history and make them new for now in their murals. The one you feature [item above] brings to mind the many eyed state we are observed by. The headdress suggests Ptolemaic Egypt, along with the crossed arms and seated pose. The surreality bridges the Venus of Willendorf to Bentham's Panopticon. Which seems to encompass where we are. Here's a favorite: Joan Miró meets narcotrafficante (image, right). "Hey, Larry, lemme have another look at those blueprints, willya?..." Large installations have been popular in Naples at Christmas for a number of years, usually in the large open square, Piazza del Plebiscito on the west side of the Royal Palace. See this link for examples of earlier years. (Some weeks later) It wound up looking like this (image right). It stayed up into February, did not topple in the wind, had a wildly flickering light display ALL NIGHT, was thronged by visitors, and a good time was had by all. Not bad. This is THE END of Miscellany page 66.